Col. Yuliy Mamchur is reportedly being held by the Russian military in a jail in Sevastopol. KIEV, Ukraine — A Ukrainian air force commander is being held after his base in Crimea was stormed by pro-Russian forces, and the acting president called for his release Sunday. Col. Yuliy Mamchur is the commander of the Belbek Air Force base near Sevastopol, which was taken over Saturday by forces who sent armored personnel carriers smashing through the base’s walls and fired shots and stun grenades. One Ukrainian serviceman was reported wounded in the clash. It was unclear if the forces, who didn’t bear insignia, were Russian military or local pro-Russia militia. Ukraine President Oleksandr Turchynov, in a statement, said Mamchur was “abducted” by the forces. He didn’t specify where Mamchur is believed to be held. However, prominent politician Vitali Klitschko said Sunday that Mamchur is being held by the Russian military in a jail in Sevastopol, the Crimean city that is the base of Russia’s Black Sea Fleet. Klitschko was one of the leaders of the three months of protests in Ukraine that culminated in late February with President Viktor Yanukovych fleeing the country and interim authorities taking power before a May 25 presidential election. The protests were triggered by Yanukovych’s decision to reject a deal for closer ties with the European Union and turn to Moscow instead. Yanukovych’s ouster was denounced by Russia and much of Ukraine’s ethnic Russian population as a coup. Soon thereafter, Russian forces took control of Crimea and the region held a referendum to break off from Ukraine and join Russia. 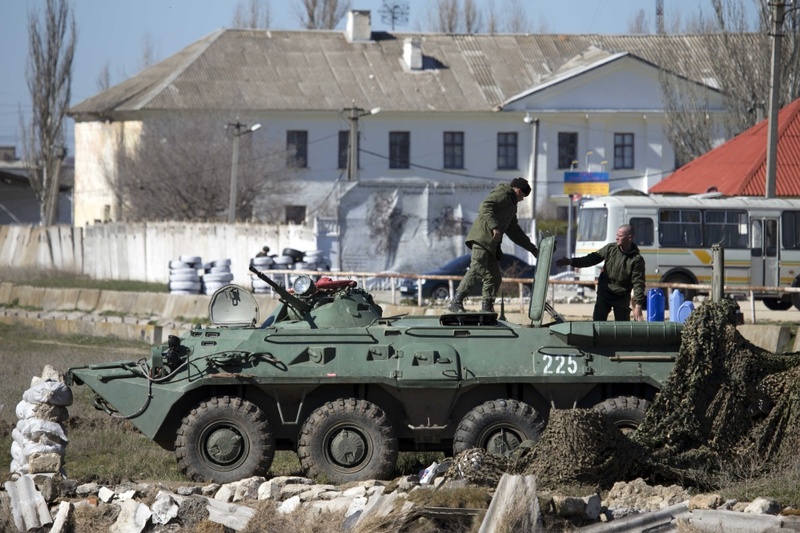 Russia formally annexed Crimea last week, a move that Western countries say is illegitimate. The U.S. and the EU have imposed sanctions on Russia in the dispute, but Moscow appears unmoved. On Sunday, the Russian Defense Ministry said the Russian flag was now flying over 189 military facilities in Crimea. It didn’t specify whether any Ukrainian military operations there remained under Ukrainian control. At a Ukrainian marines base in Feodosia, troops were negotiating with Russian forces on handing over the base, Lt. Anatoly Mozgovoi told The Associated Press. The marines were loading 50-caliber machine guns into armored personnel carriers to take them to the base armory, but Mozgovoi said they hope to hold on to heavy weapons such as rocket-propelled grenades and cannon. “I think from my personal opinion, the Russian Federation has enough weapons,” he said. In Donetsk, one of the major cities in eastern Ukraine, about 5,000 people demonstrated in favor of holding a referendum on secession and absorption into Russia. Eastern Ukraine is the country’s industrial heartland and was Yanukovych’s support base. Donetsk authorities on Friday formed a working group to hold a referendum, but no date for it has been set. Russia has deployed thousands of troops in its regions near the Ukrainian border and concerns are high that it could use unrest in the east as a pretext for crossing the border. On Sunday, Russian deputy defense minister Anatoly Antonov was quoted by Russian news agencies as saying the number of Russian troops in the area of the Ukrainian border does not exceed international treaty limits.